Choose either the 2 Bedroom Bungalow or add the 1 Bedroom Apartment for 3 Bedrooms. *The 1 bedroom apartment is never rented out separately for your privacy. 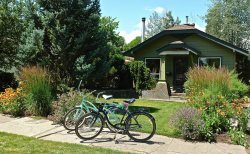 The Kingfisher Bungalow is tucked into a quaint and quiet neighborhood on Bend's popular Westside, just 2 blocks from the 1st Street Whitewater Park on the Deschutes River, in walking distance to Downtown, and all the best Bend has to offer! There are 2 Bedrooms in the Bungalow, and a separate Studio *Apartment with a living area and a king master suite. A beautiful flagstone garden courtyard creates just the right amount of privacy and gathering space between the two. *The apartment is never rented out separately. The Bungalow sleeps 4. The Studio Apartment sleeps 2, the full property sleeps a total of 6. Again, the studio is NEVER rented out separately, so if you are only in the bungalow, the studio will remain unoccupied. *Additional rates apply for the 3rd bedroom studio apartment. The location of the Kingfisher Bungalow is exceptional! Just blocks from the river, Pioneer Park, First Street Rapids Park, and the popular shops, restaurants, and pubs on Newport Avenue and Downtown. Hop on one of the 4 cruiser bikes provided and explore Bend like a local! You will find so much to enjoy in this charming bungalow! Enjoy the upscale and eclectic decor, soak in the hot tub, enjoy the gardens, play foosball in the apartment game room, or cozy up to the wood burning stove. There is an HDTV in the downstairs den, and another HDTV in the apartment living room. Prepare an unforgettable meal in the fully equipped gourmet kitchen. There is sit down dining for 6 and a sunny breakfast nook. Or, cook out on the Weber gas grill, there is outdoor dining for 6 on a charming garden deck. Relax and unwind with a good book in the enchanted gardens or soak up some sun on the front deck. Enjoy a soak after a day of adventure in your own private hot tub under a Central Oregon starry sky! • Apartment has an HDTV, living and game room with a foosball table! As always... another incredible stay here in Bend! In fact, were already booked to come back in February. You guys are awesome! Wonderful house! We were so comfortable! Everything we needed and amazing help from the Bluebird Day ladies! Well be back. Thank you! What a fantastic stay in Bend! LOVED the Kingfisher, this home surpassed all of our expectations! :) We were so pleased with the accommodations and downtown... and of course, Mount Bachelor! Thanks for the great home, I would love to have the decorator do my home!! We had an amazing time in Bend and wish we could stay longer. The Kingfisher Bungalow was perfect for the 4 of us! Its a beautiful cottage in a perfect location. We had great weather-- warm in town and snow on the mountain. Loved the hot tub in the adorable backyard garden! My niece had fun looking for fairies. ;) We hope to come back again soon! We had a wonderful stay! Such a great little bungalow! all day at Smith Rock climbing, then hot tub under the stars. :0 The home is beautiful-- great remodel with great upgrades! Feels like home-- love being in a neighborhood. Cozy everything; beds, claw-foot tub, kitchen nook, back yard, wood burning stove, down comforters... white, clean and neat. Bend always feels just right! My husband and I stayed here when we were in Bend for a wedding. It was the perfect accommodations for us and a friend with a 1 year old. The location is great, close to the river and downtown. The house is decorated so well and every detail has been thought out. The bed and bedding rivaled that of a high end hotel. We also took full advantage of a morning and evening dip in the hot tub. Everything was very clean and well maintained. I would recommend this house to anyone. It made me want to live there!! We traveled with our friends and began our trip to Oregon in the Mount Hood area. As an extension to the trip, we wanted to include the Bend area. In searching for a place to stay, we came across the Kingfisher Bungalow and are so glad we did. The bungalow was in perfect condition and a perfect location for us to explore Bend and the surrounding area. The house was well stocked, comfortable, and met all of our needs. We were able to do several hikes (the hot tub was amazing afterwards) and an easy day trip to Crater Lake. Access to the river walk was right down the street and a 10 minute leisurely walk to downtown Bend. We so enjoyed our stay at Kingfisher. Our only regret is that we didnt have more time. If we ever get back (and that is a great possibility), we will definitely be looking to book this bungalow again. Thanks for everything! This home is centrally located and is in a very nice neighborhood near the river. The kids had a great time and were able to stream some fun videos in the entertainment room. The kitchen has all youll need. The hot tub area in the backyard is so relaxing with a pond and is fenced for privacy. Bedrooms are comfortable and both have their own private bathrooms. This home is a true gem in the heart of Bends westside. My husband and I, along with our toddler and infant son stayed at the Kingfisher for a week of skiing and exploration. The home itself is perfectly situated within walking distance of shops and restaurants. The layout of the home is perfect- not too big, not too small. Just super cozy! The hot tub was a nice treat after a long day on the slopes and the two beer "growlers" were a great idea for us fill up with some of Bends signature beers. Reservations were easy and I liked how the managers checked in via email to ensure we had everything we needed.. We will certainly be back! We had such a great time in this home. Super close to the Deschutes River Trail (entrance at the end of the street) for hiking and running. Really close to downtown, were able to walk to the great local restaurants for amazing food and drinks. The home itself was very comfortable and clean. The Bluebird Day Vacation staff was great to work with. Will absolutely contact them again for our next visit to Bend.